Listeners loved the novelty of Mrs. Miller. She sang off key and out of sync with the band, but she was a good-natured, plump 59-year-old woman whose enthusiasm for performing and overconfidence in her singing ability seemed authentic. "The '60s Housewife Who Couldn't Sing - But Landed on the 'Billboard' Charts Anway"
Recently I saw the movie Florence Foster Jenkins, starring Meryl Streep and Hugh Grant. The film is based on the true story of a New York socialite by that name. Florence Foster Jenkins, who was portrayed by Streep in the film, was an amateur soprano with poor singing ability. Known for her flamboyant costumes, she became something of a cult figure in New York City during the 1920s, 1930s and 1940s. On October 25, 1944, at the age of 76, Florence performed at a sold-out concert at Carnegie Hall. The concert turned out to be her swan song. She died about a month later, on November 26, 1944. After viewing the film about Florence Foster Jenkins, I was reminded of Elva Miller, who recorded under the name of "Mrs. Miller" and was a cult figure of the 1960s. Since I have an interest in '60s pop culture, I decided to do some research on Mrs. Miller. I wanted to know how in the midst of the of the Vietnam era and the civil rights struggle, she became so popular. At a time when young people were told not to trust anyone over 30, how did this 59 year-old suburban housewife become a star? Elva Ruby Connes was born in Joplin, Missouri on October 5, 1907, the third of the seven children of Edward Connes and Ada Martin. Elva's family soon moved to a farm in Jetmore. Kansas. As a teenager, Elva left Jetmore and went to live with a family in Dodge City, Kansas. In Dodge City, she continued her high school education and sang in a church choir. On January 17, 1934, Elva married John Richardson Miller, a professional investor and horsebreeder who was thirty years her senior. In 1935, the couple left Kansas behind and moved to Claremont, California where Elma studied music and voice at Pomona College. 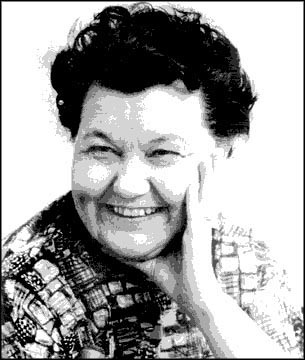 Elva kept busy with church and community work and produced several recordings which she financed on her.own, mainly classical, gospel and children's songs. When arranger Fred Bock heard her, he persuaded her to record some contemporary songs and offered the recordings to various record companies. The story of Mrs. Miller's rise to success is extraordinary. Within 18 months, she rocketed to fame. 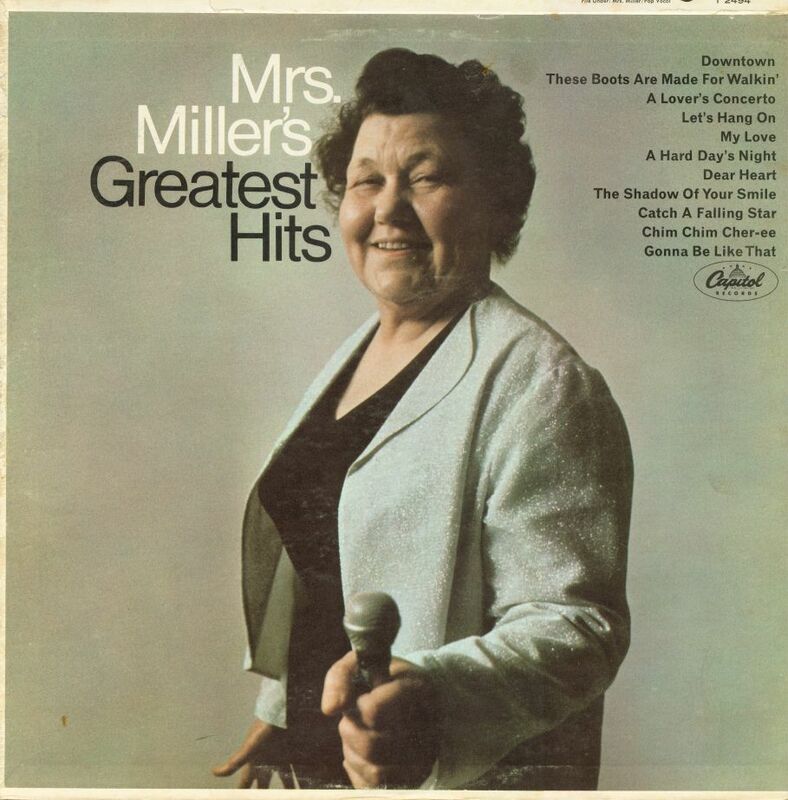 Her debut album, Mrs. Miller's Greatest Hits, sold 250,000 copies within three weeks. In April of 1966, her rendition of Petula Clark's hit song "Downtown" reached the Billboard Hot 100 singles chart, peaking at Number 82. Below is a promotional ad from Capitol Records for Mrs. Miller's Greatest Hits. The ad also highlights Elva's whistling and humming ability. You've been teased long enough. This is Mrs. Elva Miller, our newest vocal find, with her distinguished and well-mannered sound. Mrs. Miller is a singer a whistler, and a hummer. 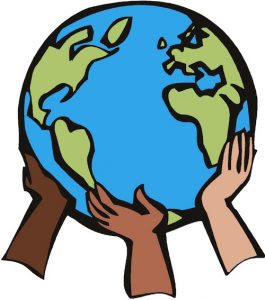 She is also a founder of the Foothill Drama and Choral Society, located near her Claremont, California home. Mrs. Miller is not one to live in the past. Today's music is her music. Classics-to-be such as "Downtown," "A Hard Days Night," "These Boots Are Made for Walkin'," and "Let's Hang On" are inimitably rendered in her new album. Thus,we believe they now belong to the ages. By that token, we at Capitol proudly introduce a new talent and a superlative musical document, "Mrs. Miller's Greatest Hits." Was Mrs. Miller's Greatest Hits all just a gag, a tongue-in-cheek joke on Capitol's part. How serious did Mrs. Miller take herself? In a December 1967 interview with Bob Thomas for The Associated Press (AP) ("Mrs Miller Tries to Change Image"), Elva shed some light on the issue and seemed determined play it straight with a new image. She stated that "Capitol Records created the angle that 'she's so bad that she's good. Or it's what you call camp." Elva also claimed that she wasn't originally in on the gag. She insisted that she didn't sing off key. She said that "They got me to do so by waiting until I was tired and then making the record. Or they would cut the record before I could become familiar with the song. At first I didn't understand what was going on. But later I did, and I resented it. I don't like to be used." 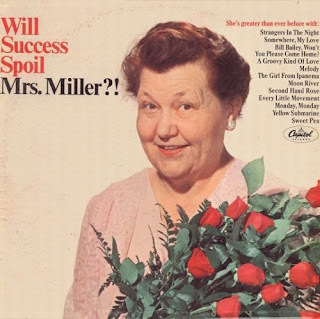 Mrs. Miller's second album for the Capitol label was titled Will Success Spoil Mrs. Miller? While Mrs. Miller's Greatest Hits focused on contemporary hits, Will Success Spoil Mrs. Miller? contained traditional pop standards such as "Moon River" and "Strangers in the Night." 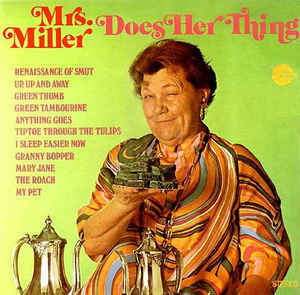 In 1967, Mrs. Miller's third and final album for Capitol was released. 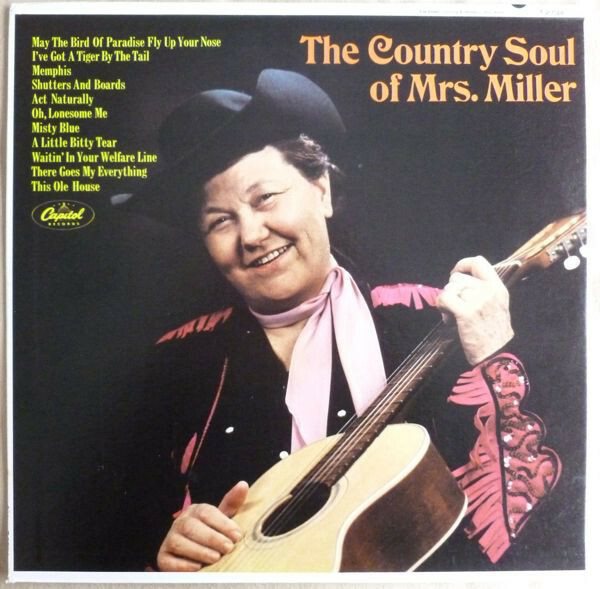 It was called The Country Soul of Mrs. Miller and it did not sell very many copies. At the height of her fame, Elva Miller performed at the Hollywood Bowl and entertained U.S. Servicemen in Vietnam. She made television appearances on The Tonight Show with Johnny Carson. 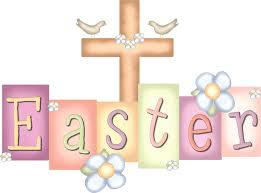 The Ed Sullivan Show, Art Linkletter's House Party and Rowan and Martin's Laugh-In. 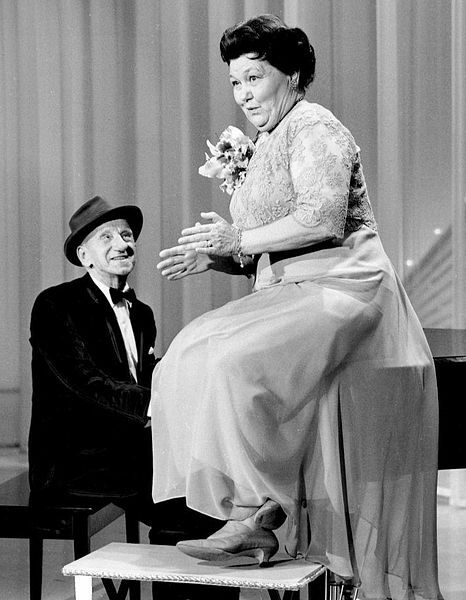 In December of 1966, she appeared on Hollywood Palace with Jimmy Durante and they sang a duet of "Inka Dinka Do." Mrs. Miller was also featured in the film The Cool Ones, starring Roddy McDowall. She sang "It's Magic." in the 1967 comedy about a has-been pop star and a go-go dancer. 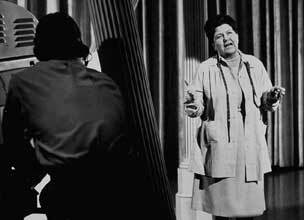 Mrs. Miller singing "It's Magic" in The Cool Ones"
After three albums, Capitol Records unceremoniously dropped Mrs. Miller from its label. In a December 1967 AP article by Bob Thomas, Elva related her feelings about being rejected by Capitol. "I could see that they were doing nothing for my records in the way of promotion," she stated, "and I felt this was a signal. So we asked for my release. Without consulting us, Capitol released the news that I was being dropped." In 1968, Elva released one album, Mrs. Miller Does Her Thing, on the Amaret Records label. She then released some singles on her own label, Vibrato Records. On the album cover, she is dressed in a psychedelic hippie outfit, holding a plate of green brownies. The album included songs with drug symbolism. 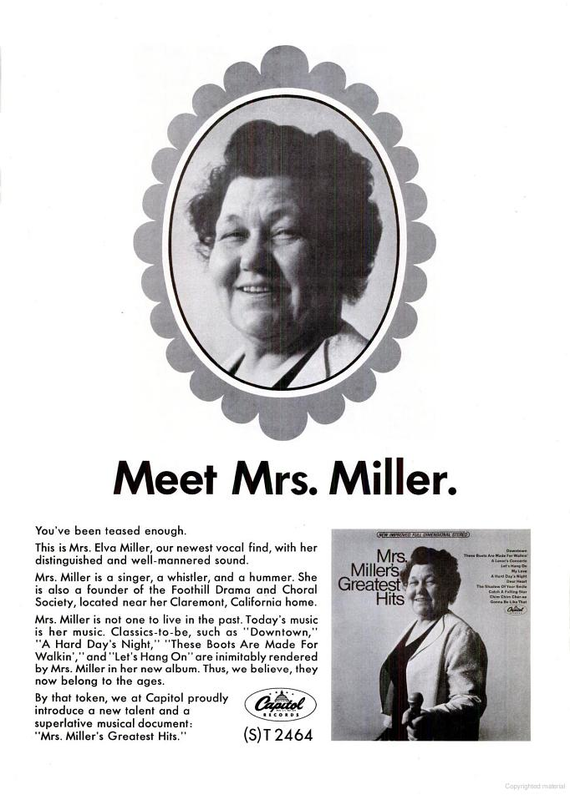 By the early 1970s, Mrs. Miller's career was largely non-existent. In 1973, she officially retired. Elva Miller spent the last years of her life in Hollywood and then in Northridge, California (in the San Fernando Valley near Los Angeles) where she occupied herself with charity work. In 1994, her Northridge apartment building collapsed during an earthquake and she was immediately moved to a convalescent hospital. On July 5, 1997, Elva passed away in Garden Terrace Retirement Home in Vista, California. Mrs. Miller was 89 years old at the time of her death. * In The Book of Lists 2 by Irving Wallace and David Wallechinsky, Mrs. Miller's voice was likened to the the sound of "roaches scurrying across a trash can lid." * Elva and John Miller did not have any children. * In a September 1967 interview with Life magazine, Elva Miller talked about whistling. She that "for whistling you need a good tight pucker. I use ice clamped between my lips. I leave it there about 20 minutes. It doesn't hurt. It just freezes up."